Titanium Backup has been a standard root-friendly app since day 1, but what if you no longer want all of that information stored on your device? What if you would rather have it in the cloud for safe keeping? That’s exactly what BackDrop brings to the table along with a couple of other incredibly handy features. In its basic form, BackDrop allows you back up all of your apps along with their application data to DropBox. 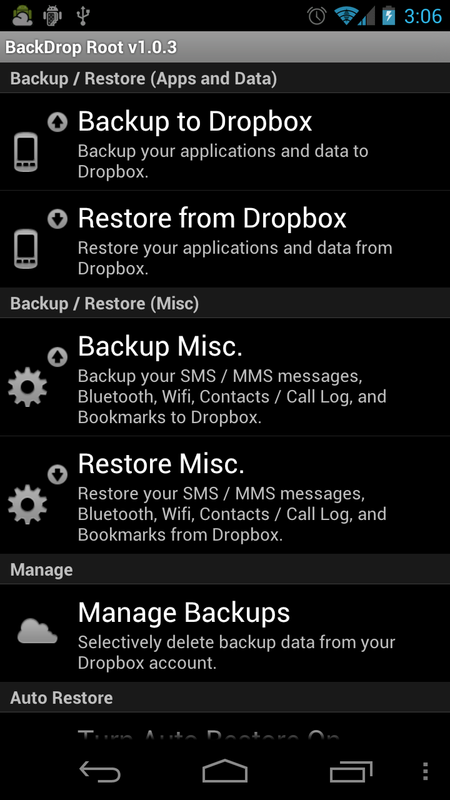 Once you have it stored, you can restore it to your phone at any time assuming you have a data connection of some sort. Not only can it do apps, but it will also do Bluetooh pairings, bookmarks, contacts and call logs, text messages, and WiFi settings. 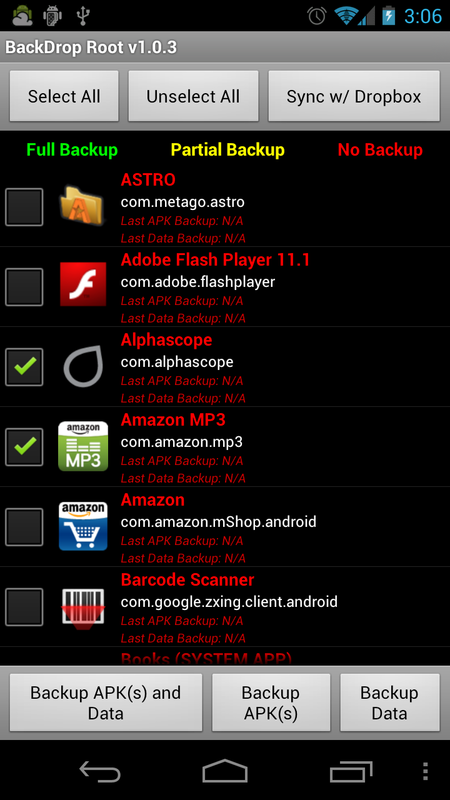 It’s a fairly fully featured backup app. Aside from that functionality, it also has two features that our ultimate ROM flashes will enjoy. The first is the ability for BackDrop to turn itself into an update.zip file that can be flashed immediately after you flash a new ROM. So on that first bootup, you will already have BackDrop installed so that you can then pull in all of your backed up apps along with their data. Nice, right? The other nifty trick up its sleeve is an “auto-restore” option that pulls in application data that you have backed up whenever an associated app is installed. From my understanding, this should grab data for apps even if you install them from the market. It somehow syncs with new apps if it recognizes them and then ties them to your data. Impressive. So the app is free in the market with a $1.99 unlock key to get you the auto-restore and update.zip options. Give it a shot. Thursday Poll: What would it take to get you to ditch your Galaxy Nexus?